Over the years, we’ve heard clients tell us that designing their “dream home” has been one of the most rewarding experiences of their lives. Not only is it a fun process, but it is eye-opening as well. You get to see what a truly custom home looks like for you. What does custom home really mean? Our home design process, being truly custom, is perhaps a different experience than what you are familiar with. Often the term “custom home” is used loosely to describe how customers can make minor changes to the floor plan or select their own fixtures and finishes. This is not what we mean. You relay the style and amenities you want in a home, and from there, we’ll review existing floor plans that are similar to what you are looking for. If one matches, there may only need to be minor changes to the design. You may look at an inventory of designs and pick out elements from a few different designs you like. From there, we’ll merge those ideas together into a new design. You may have a design of your own – either from a catalog or a sketch you did. 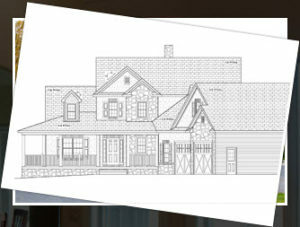 We will work with those ideas and turn them into working plans for your custom home. After we meet with you and you’ve decided to proceed, we’ll draw a preliminary set of plans, which includes floor plans and some basic elevations of the home. This serves as a starting point, and from there, we’ll continue to revise the drawing to get them right. Once the preliminary drawings are set, we’ll begin to create a full set of working plans. These plans have much more detailed and are provided to subcontractors so they can bid on the project. They are also submitted to the township for building permit approval. No matter how the idea begins – whether it is based on an existing plan or something within your mind – we give you the liberty to design a home specific to your needs and budget. Learn more about our custom home building services. Posted in New Construction on August 7, 2014 by metzler.